Sydney Bacon of North Union winds up as she prepares to toss a shot during a recent track meet. Bacon set a new school record in both the shot put and discus during this past week’s action. The Wildcats of North Union track teams may have struggled during their meet at the River Valley Relays, but one athlete had much to celebrate. The Lady Cats where able to pull together 35.5 points during the event, but that was only good enough for last place out of the eight competing teams, while the boy’s team was only slightly ahead of the Lady Cats as they could only muster 61 points to take sixth place out of the eight schools during Friday’s track meet. 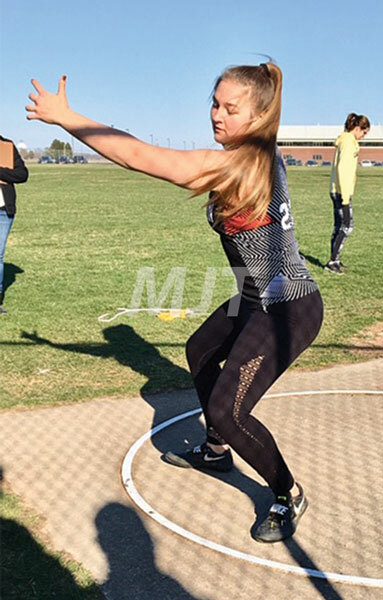 But for Sidney Bacon, she had much to celebrate as she broke the school record for the longest discus toss with a throw of 112-01 feet to take first place in the event by nearly eight feet. The record setting toss comes only three days after Bacon set the school record in the shot put with a throw of 34.3 feet during a track meet against Jonathan Alder. Bacon was also able to win the shot put during the River Valley Relay’s with a toss of 32-11 feet. The Lady Cats where also able to find success in the mid-distance medley relay with a third place finish in a time of 4:55. The relay team includes Sadie Spriggs, Meghan Fuller, Kaylee Smith and Kamryn Rhodes. The lady’s also finish third in the weight person relay with a third place finish in a time of 1:06. The team includes Bacon, Tori Stiffler, Guisella Hernanadez and Breyanna Stone. The boy’s team was able to take the top spot in the 4×800 relay and mid-distance medley relay. The 800-relay team of Adam Brown, Brennan Griffith, Ethan Mouser and Danny Burggraff took first place with a time of 8:45. The team of Griffith, Burggraff, Brown and Casey Rense took the title in the distance medley relay with a time of 8:57. The boy’s weight person relay was able to take second place with a time of 53.79. The team includes Jaxon Harrah, Kane Beltz, Zack Millard and Harley Day. Harrah also took second in the shot put with a toss of 45-09 feet. The NU track teams will return to the track Tuesday against Westfall at London High School.